Tom showing me his new earring at the cafe on the square in front of Bercy where we met up before the concert. On to Paris, for a couple of days. I was going to see Tom, only he didn’t know it yet. Tom had actually been the trigger that started me on this whole early summer vacation. In February, he had made one of those dad calls, you know the ones that begin with 30 seconds of small talk and continue with “please send me money.” I have nothing against those calls, by the way, and especially not against this one. “What do you need it for?” I asked, always the first question in the dialog. 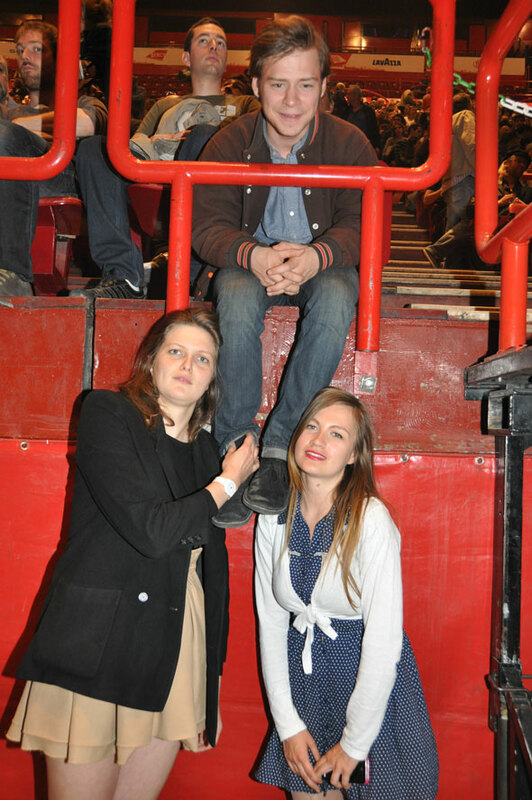 Tom and Morgane during the intermission at Bercy. “Of course,” I said, and our conversation continued easily once the subject of money had been taken care of. I looked up the concert on line, and spontaneously bought four tickets instead of the two he’d requested. I’d always loved Cat Stevens, ever since the winter of 1971-2 when, living with Kathy Grant and Dennis Cruise in Edmonton, Alberta, “Teaser and the Firecat” and “Tea for the Tillerman” were playing constantly all over town. I was a hippy then, hitch-hiking my solitary way backwards and forwards across Canada, and Cat’s music and lyrics were a perfect fit. Yet I’d never seen him live in those 40 years. I’ve seen a lot of the great classic rockers live, up to and including the Beatles. Yes, that’s right: in fact, the Beatles were my very first rock concert. Now, now, Ian, stop showing off! But I’d never seen Cat. 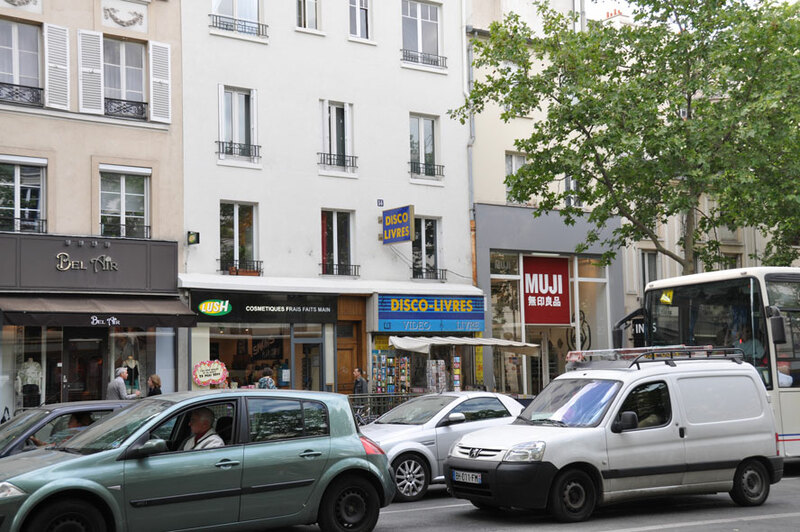 Part of the reason was that he had made an abrupt switch of careers intertwined with a spiritual discovery, all of which meant that he had totally stopped playing music. It’s hard to go see someone who isn’t there. Here he is, the man himself, early in the show at the Palais des Omnisports, Paris. I hadn’t known that I’d be able to go this time when I bought the tickets. That depended on how much I earned in the interim. I did look for other things to do if I made it to Europe at the end of May, and two days after the concert there was the UEFA Champions League Final at Wembley Stadium. This was beginning to look very serious! As May 26, the date of the concert, approached, it became clearer that I was going to be able to go and make a vacation of it. I decided to surprise Tom, and not let him know that we were going to meet up at the concert. 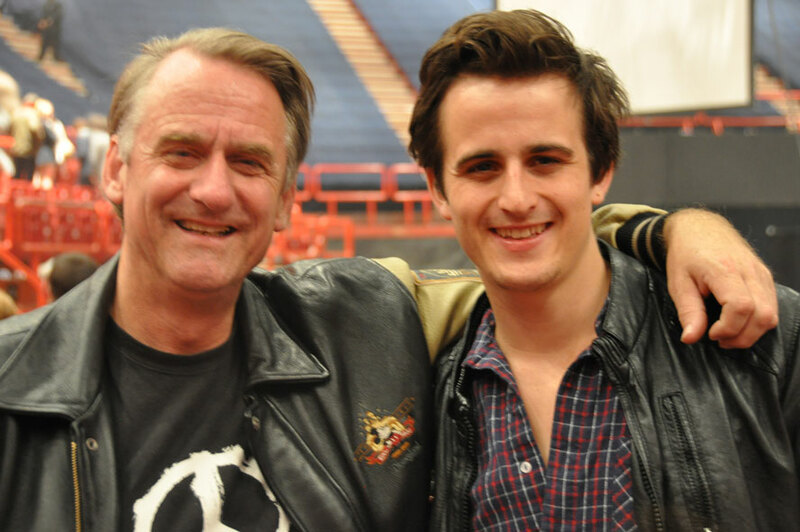 How perfect would that be, this “father and son” at a concert given by the writer and singer of the great song of the same name! There were nay-sayers, of course, who talked about the difference between seeing Cat Stevens back then and seeing Yusuf now, voicing my own doubts and worries. What if he didn’t play his old songs? What would new Yusuf songs sound like? What would he sound like? Who was he now, calling himself Yusuf, a practicing and apparently devout Muslim? I was convinced that the incredibly nice guy responsible for “Morning has Broken” and “Sad Lisa” would take care of his audience and give us what we wanted. But how can you be sure? Fingers crossed! Whether or not he sang “Father and Son,” which Tom in his turn has sung for his dad, I figured that we would have fun together. Here’s the big screen, which was on the left side of the stage, our left. Modern concerts are so good at letting you see so much. The surprise, in a café on a terrace in front of the concert hall, went well. Tom showed me his earring and I bought him and Morgane, his girlfriend, a drink. The concert was timed to start at 8 pm, and we stopped at the T-shirt store inside the auditorium to buy a couple of souvenirs. The lights were already dimmed as we made our way to our pretty good seats. That voice was already singing, “Lilywhite” to be precise. I couldn’t believe it and tapped Tom on the shoulder: “he sounds exactly the same!” He did. He looked a whole lot different, with that bushy grey-white beard and his eyes hidden behind glasses. But it was the same voice signing the same songs. 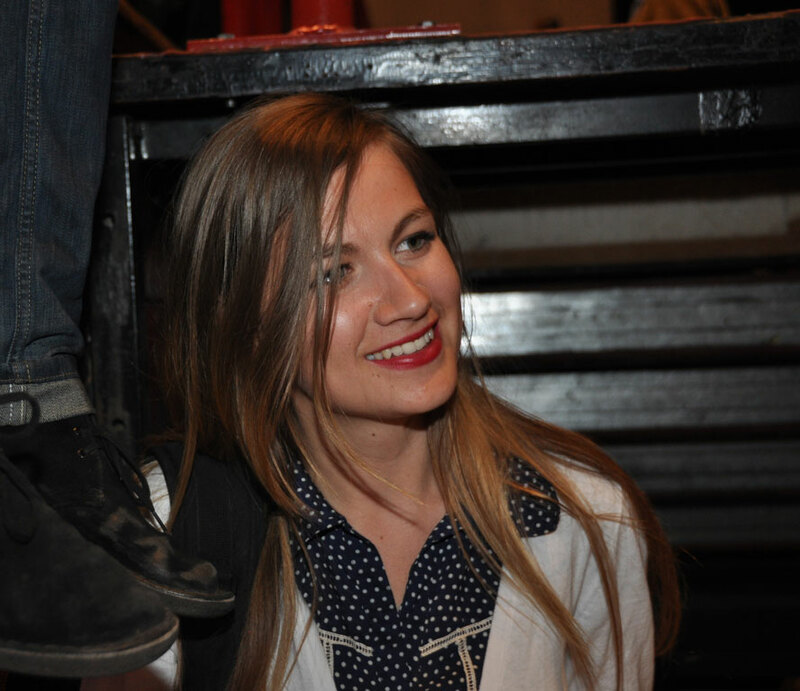 Here’s Morgane, during the intermission. She and Tom were dating when I visited last summer, but they had apparently taken time off in the interim. Things seemed to be going well between them this evening at least. Maybe it was relief that the concert wasn’t going to be as strange as some had foretold, or sheer joy at rediscovering those beautiful songs that meant so much all those years ago, but I started tearing as he sang “Miles from Nowhere,” and basically didn’t stop tearing on and off until we were outside again after the music was over. “Miles from nowhere,” went the song, “not a soul in sight, oh yeah, but it’s alright. I have my freedom, I can make my own rules, oh yeah, the ones that I choose. 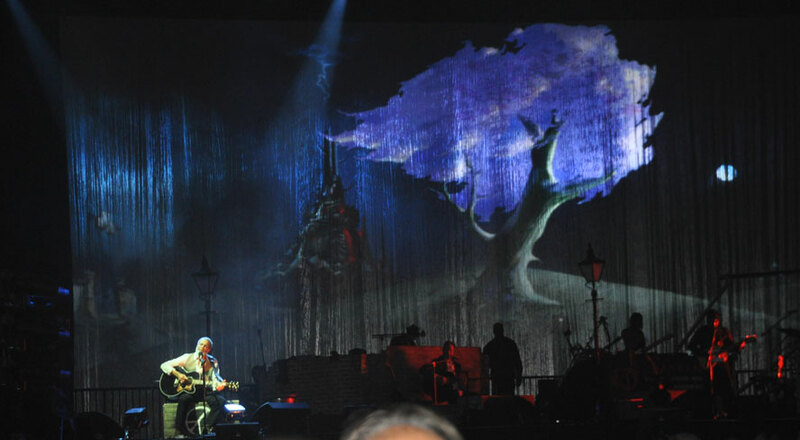 Cat Stevens in front of his Moonshadow backdrop. I was right there all those years ago on the Trans-Canada Highway, somewhere in the middle of the Prairies or maybe North Ontario, thumb out, squinting into the sun, feeling the big sky, the massive land, literally miles from nowhere. I was dreaming again of a better world, a world where everybody cared and was strong enough to care. Those years drifting along an interminable highway have illuminated my entire life. They have too rarely been revisited or relived. This night with Yusuf was one of those rare times. During the intermission, the young people found friends. Mathilda is Morgane and Tom’s friend who accompanied us. 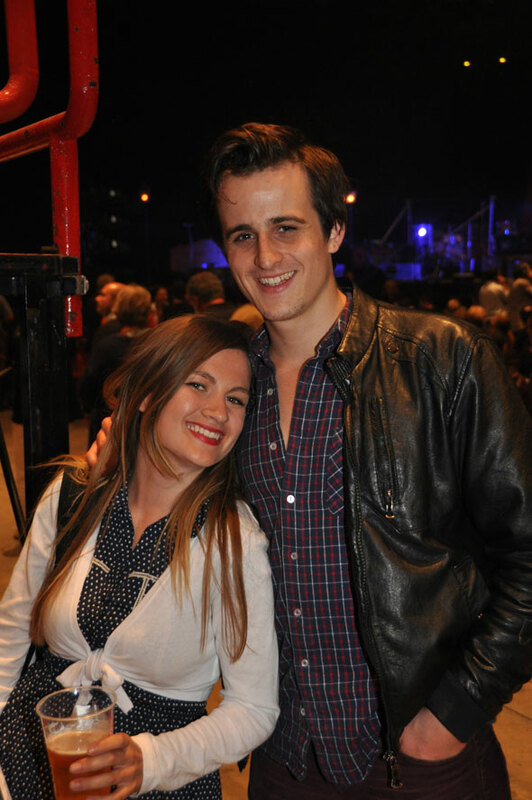 She is from Watlington, a village on the Thames in Oxfordshire, and her boyfriend’s name is Olivier! I forget the name of their friend with his legs dangling over the barrier. Check out the guy with the beard top left glaring! “Well I left my happy home,” sang Cat, “to see what I could find out, I left my folk and friends with the aim to clear my mind out. Well I hit the rowdy road and many kinds I met there, many stories told me of the way to get there. I was back in a modern Parisian concert hall sitting next to Tom, feeling warm and full, feeling just fabulous. This is what it was all about, a continuum, the father a little less naïve than he was, the son a young dreamer wanting to make a living playing the music he loves. There was an intermission, and we wandered off to grab a beer and Tom and his friends chatted with other friends they found there. I kept daydreaming to myself that Cat would sing “Father and Son” for Tom and me in the second half of the show, and I really wanted him to sing “Peace Train” too, just because that was what he was all about, that’s what this was all about. Of course, he did both. It was that type of night. 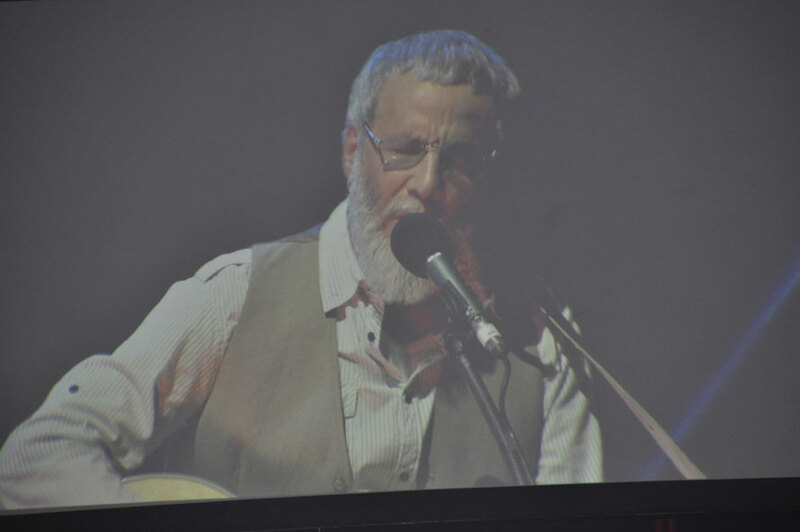 Yusuf was Cat Stevens tonight, and he was playing for fans like me, and he was going to make us all as happy as he could. He’s that type of guy. I put my arm around Tom’s shoulder when “Father and Son” started, and sang along, and Tom put his arm round my shoulder and sang along too, only much better: Tom has a voice! The tears were streaming down my face throughout the song. The young people looked across at me at one point, a little worried for me, I think. There was nothing to worry about. This was it, exactly as I had fantasized. Cat told us about how he had finally picked up a guitar again, after 25 years without touching one. His son had brought one into his house, and left it in the living room. After a few days, Cat had felt the guitar calling him, and had picked it up. Father and son. “Now I’ve been smiling lately, thinking about the good things to come, and I believe it could be, something good has begun. Oh peace train sounding louder, glide on the peace train!” You will have noticed that it is a steam train, a monster with a peace sign on the front. The same sign is on the T-shirt I wore that night, a birthday present from Alex. Peace calls him too. 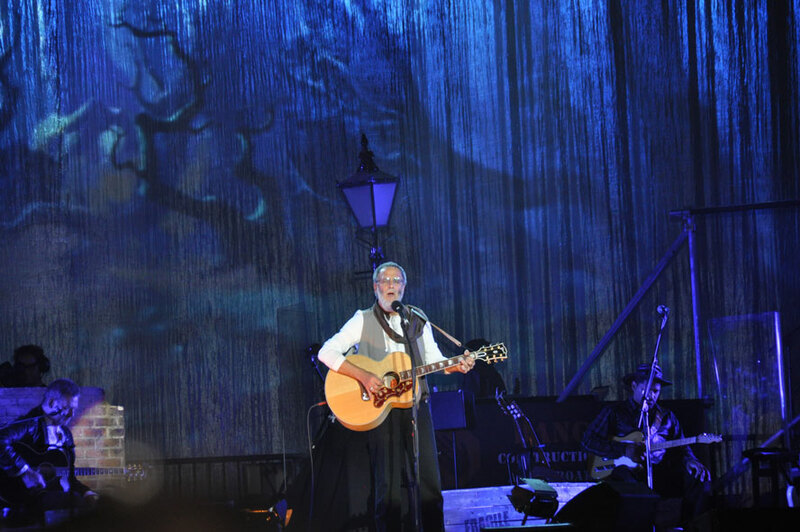 Yusuf worked all those years without his guitar in “education and relief,” he told us. 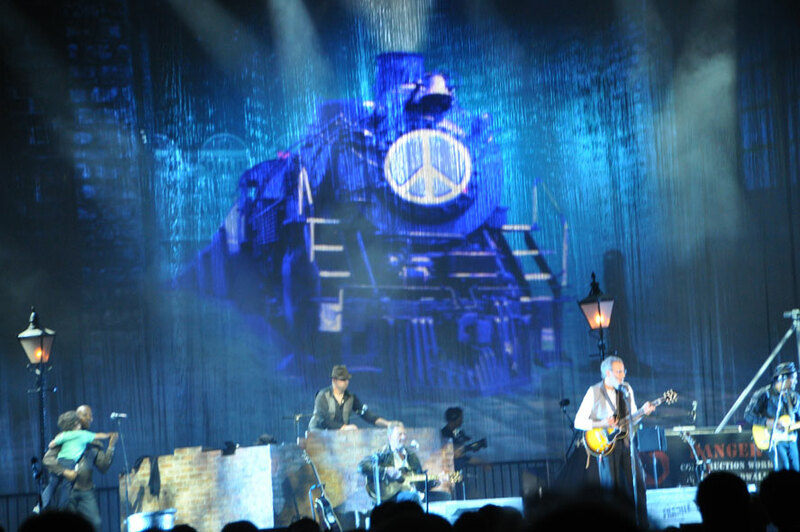 “Peace Train,” was the last encore, sung from the heart. One of the musicians had brought his baby with him when he came back on stage, and played with the baby in his arms. The musicians all threw good old hippy peace signs to the audience before turning away and finally leaving the stage. It’s been a while since I saw that at a concert.